I have always loved a highlighter and always will. My highlighter collection just keeps growing, I can't help myself. Crown Brush recently launched a new product, the Bronze and Glo Palette which I have been very excited about. Do I need more highlighters? No. Will I keep getting more highlighters? Yes. This palette really intrigued me with having some paler shades and then a mixture of darker more bronze shades. I have been trying this palette out for over a couple of months now and thought it is about time I told you what I think and show you some swatches of course! We all know I love a good swatch. I was impressed they had a very pale white pearl shade which is perfect for extremely pale skin tines then the shades build up. When I first looked at the palette I thought some of the shades looked a little dark and wouldn't work on my light/fair skin tone but when you swatch and use them the shades appear lighter than in the pan. As soon as I swatched the powders they felt buttery and soft and I just knew they would apply well. I usually use the Real Techniques Setting Brush to apply my highlighter and it picks up the product well. When applied they give an almost wet look and they melt into your skin. I find some powder highlighters look like powder on your skin but these ones definitely melt into it and look flawless. You can apply a small amount for a subtle glow but of course I love a good old intense glow, the you can see me from the moon type of glow! They build up to be so intense! I have been using this palette so much but using each shade differently. I of course use them as the cheekbone highlight but I have also been loving to use them as eye shadows. They don't feel heavy and stay put all day. I either apply them on their own or apply them on top of another shade to make it pop even more. The white pearl shade works amazingly well as an inner corner highlight. I have always loved a matte bronzer but recently I am loving a slight glow. As I have oily skin I don't tend to apply any liquid type highlighters as they can make me look more oily so I stick to powder products. I am loving applying a matte bronzer and then adding a very slight dusting of the darker shades in this palette on top of the bronzer. If gives an ever so subtle glow, it isn't glittery just a glow. It makes my skin look super healthy. 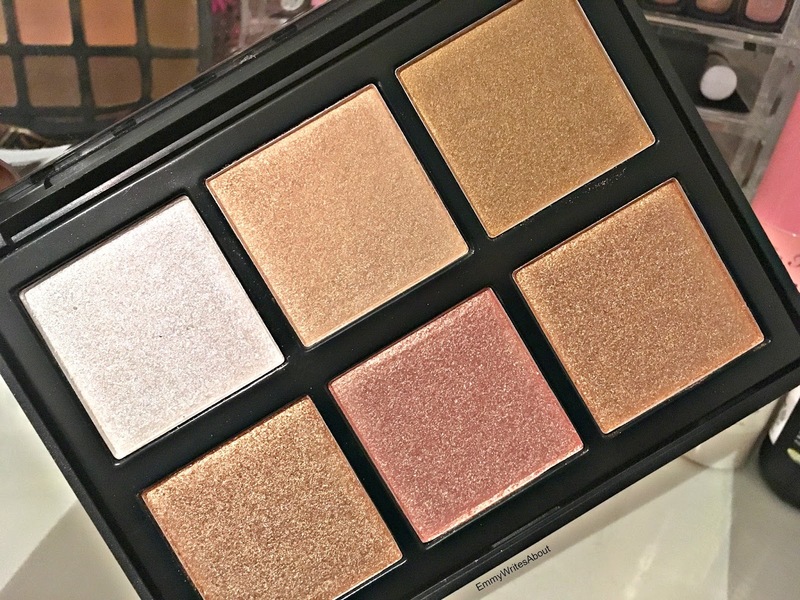 I think this palette would be great if you are going away as it is lightweight but can be used as highlighters, bronzer toppers and eye shadows. Who doesn't love a multi use product?! The Bronze and Glo Palette retails for £22.99 which I think is really good when you look at other highlighting palettes such as NYX which retail for a similar price.